The Merlo Telescopic Handler 42.7 Hybrid has been awarded a gold medal by the experts from the independent Agritechnica Innovations Commission, and was announced by the German Agricultural Society (DLG). The Merlo Hybrid was chosen among 400 innovations that were submitted thanks to its practical application, consumption & pollution reduction. In brief because it’s a product that better interprets the evolution of modern agriculture. Outdoors: any application since it can work in both a full electric and a hybrid mode. It offer a modular solution which can be integrated in the current layout of Merlo machines and extend this application to the whole future range of Merlo telehandlers. The performance level of conventional Merlo machines is guaranteed in terms of acceleration, pulling force, maximum speed, load handling time and load capacity. 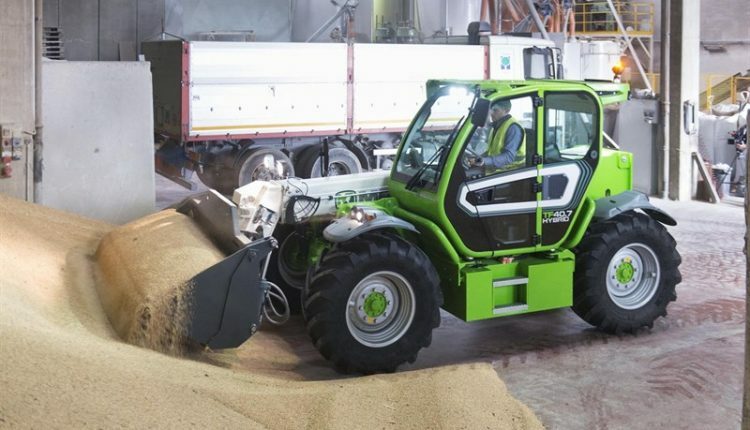 Fuel consumption in an average work cycle is reduced by at least 30% compared to conventional Merlo machine. Noise emissions are signifi cantly lower in the hybrid mode, because the Diesel engine runs at low rpm. Furthermore, noise emissions in the full electric mode are close to zero, as they are comparable to background noise in the work environment. Pollution is reduced because a smaller engine is used at a steady rpm for work stages whose specifi fuel consumption is low. Furthermore, the batteries can be recharged from either the mains or local solar panel energy network installed by the end user, allowing the vehicle to work always in a full electric mode with no exhaust emissions. Repeated tests, performed both on test benches and on a test track, have proved that operation in the full electric mode guarantees the traction and lifting performance required, and it allows the vehicle to be used indoor with an autonomy of a few hours depending on the type of activity to be carried out. Considering the fuel saving that the new Merlo hybrid system ensures Vs the correspondent “traditional” version with only thermic engine, the payback for the owner is of about two years (depending of course on the number of hours and of the kind of activity).